Techies UNITE! CEL Opens TODAY! The Biggest Consumer Electronic Show is finally in TOWN! This is one show that we all should NOT missed. See you all at the Consumer Electronics Live! 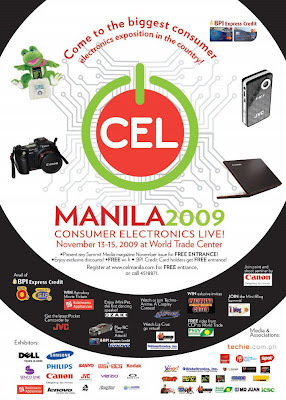 November 13 - 15 , 2009 at the World Trade Center! Bring any Summit Media November issue for FREE ENTRANCE!